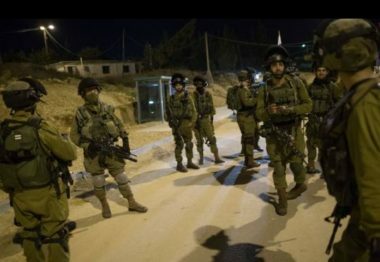 The Palestinian Prisoners Society (PPS) has reported that Israeli soldiers have abducted, during massive invasions of homes, on Wednesday at dawn, at least fifteen Palestinians, from different parts of the occupied West Bank. In the southern West Bank district of Hebron, the soldiers invaded and ransacked several homes in Beit Ummar town, north of the Hebron city, and abducted six Palestinians, including a child. They have been identified as Mohammad Monir Ekhlayyel, 37, Ahmad Khader Abu Mariya, 50, Maher Ibrahim Sabarna, 35, Waheed Abu Mariya, 14, Ayman Ali Abu ‘Arqoub, 32, and Omar Rajoub. Also at dawn, the soldiers invaded Silwad town, east of the central West Bank city of Ramallah, violently searched and ransacked homes, and abducted a former political prisoner, identified as No’man Hamed, 21. The soldiers also searched homes in Ni’lin town, northwest of Ramallah, searched homes and abducted Firas Nafe’, 20. Furthermore, the soldiers abducted two Palestinians from ‘Aqaba town, in Tubas, during violent invasions and searches of homes. The two Palestinians have been identified as Amro Ahmad al-Masri, 24, who is also a student of the Al-Quds Open University, and Salah Yassin Ghannam, 23. In Qalqilia, in northern West Bank, the soldiers searched a few homes, and abducted Abdullah Khaled Radi, 23. In Nablus, in the northern part of the West Bank, the soldiers invaded and searched homes, before abducting Nadeem Nazeeh Ismael, from Beit Dajan town, east of the city, and Omar Raslan Qandeel, from Balata refugee camp. In occupied East Jerusalem, the soldiers abducted a young Palestinian man, identified as Ahmad Hisham ‘Obeidat, 24.